Use the Force, or the lightsaber, or whatever you got lying around. This is one of the new energy blades for the year, as Bladebuilders seems to be doing as well as or better than action figures with much of the general public right now. Kids love to hit things! Hasbro sent along this press photo and block of copy for you, the viewer. Young Padawans can choose to follow the dark side or the light side with this premium lightsaber! Imagine fighting on the light side by attaching a Jedi connector piece and automatically activating blue light effects, or simply switch the connector piece to battle with a red Sith blade. For more action, press the button on the connector piece to expand the hilt for ultimate customization! Compatible with BLADEBUILDERS LIGHTSABER components, each sold separately. 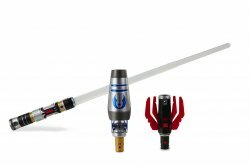 Includes lightsaber and 2 adjustable connectors. Here's a neat one - Entertainment Earth (sponsor) has a Star Wars Yoda Lightsaber Table Lamp from United Cutlery, and it's pretty neat. You can outfit it with pretty much any light bulb, including a green one which you can snag at pretty much any Walmart or party supply store for a couple of bucks. This definitely adds a nice glow to the item. See the glowing green animated pic after the jump. Here's a fun bit of trivia - a new SKU is hitting stores! In my quest across the desert, I found a Walmart and a Target that each had assortment #A1189, which is a new basic Lightsaber assortment - not refreshed packaging for the previous assortment, but a new SKU with a new DPCI at Target.